Do You Have Petal Power? Hello everyone, I guess your asking yourself what is petal power? Guess what I was wondering the same thing. I thought it was a cute title so I decided to go with it. LOL, LOL!!! No for real, petal power is when a flowers petal stand out from the rest of the flower. What do you think? Well my notebook today, has petal power. The petals are so vibrant and rich, I just love it. 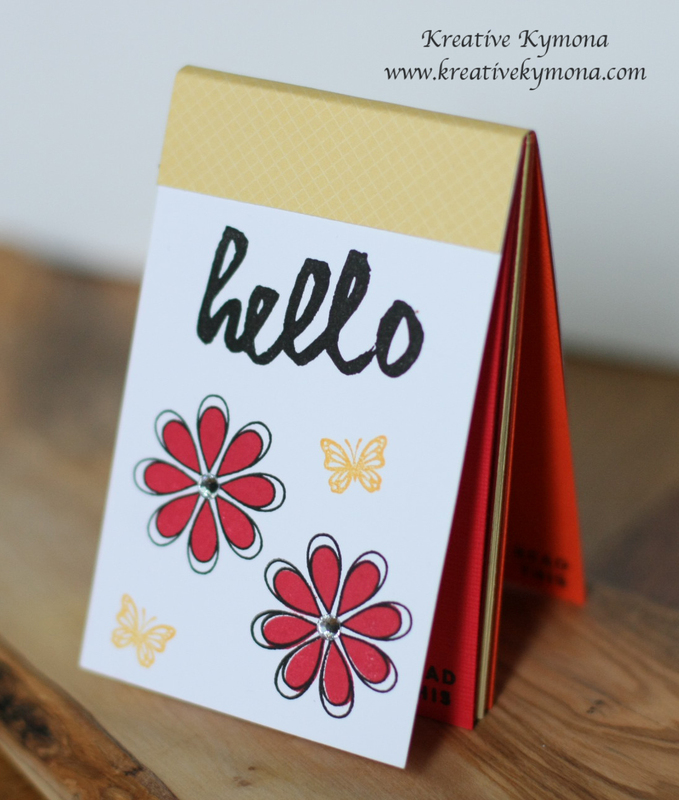 Papertrey Ink’s Make It Monday #167 Challenge is DIY Notebooks! Yes, notebooks. So cute and irrepressible. I couldn’t wait to participate. This mini notebook was so easy to make, I just love it. 1. I cut all of my card stock and back chip board to 2-3/4 by 4-1/4. 2. I stamped “read this” sentiment from PTI’s Clip Tips on all of my colored card stock inside my notebook. 3. 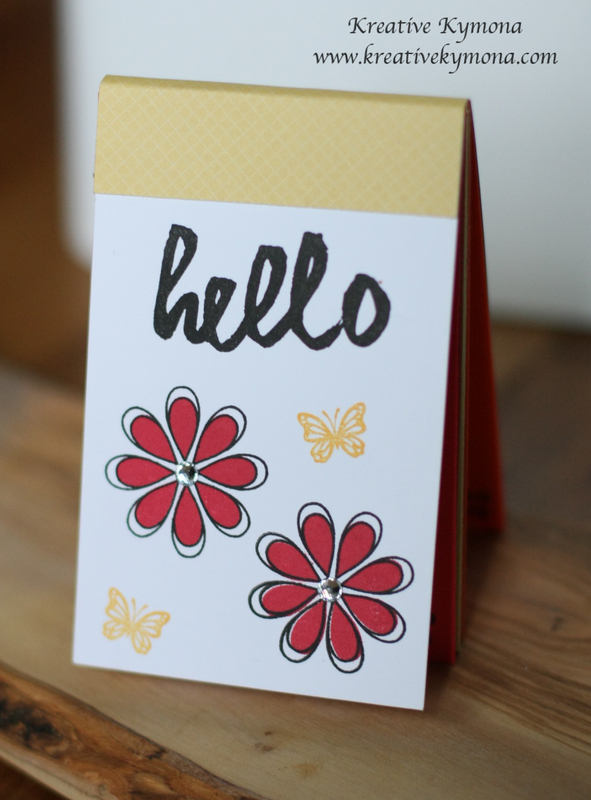 I stamped my flowers, butterflies and hello sentiment on my front cover. 4. I attached a piece of pattern paper to the top of the cover and to the back of the book with glue. The pattern paper will hold all of my pages together. 5. I added double-side adhesive to the middle of the pattern paper. 6. I made sure all of the pages of my books were attached to the adhesive. 7. Then I used my hand to crease the front and back of the book. All of the inside pages should be adhered to the double-sided tape. WALA, your book is made and ready to use! The double-sided tape allows you to tear the pages out of the book and put it back. Please let me know what you think of my Mini Notebook! « Can You Have To Much Watercolor? Hey Erica, thank you. Its not a card its a mini notebook. Thank you Tenia!! I might have to use your phrase!! Its so cute. Sweet ”petal power’ on your notebook, Kymona 😉 Love the pretty colors and those butterflies too. Thanks Helen!!! I just realized that you posted several books!! I love them all. Wasn’t this a great MIM!! I can’t wait to make a couple more!! Kymona, Thx for your comment the other day re: MIM notebooks – your blog looks great and I started reading your other entries and found out abou the class you took. What a great idea! Thanks for sharing what you learned. Your Petal Power notes are cute– I’m still trying to figure out how to add all those product links! Thank you so much Polly! That class was awesome Polly. I highly recommend taking that class. Creative Live is a great resource with a lot of class that are free while they are on the air live. The instructor April is so nice and willing to help. One of the students in the group started a private Face Book group and we continue our conversation there. April included. If you want more information, I can help you with that. You have blogger so I will check and see how you can add the links for the products you use. Give me a few to figure it out. Beautiful Note card Kymona 🙂 love the stamping ! Thank you Deepti. It was a fun mini book to make. I want to make some for my daughters classmates.